What does it look like to grow up? It’s an interesting question to ponder, really, because the fact is that (in my personal opinion) most of us never truly grow up. Oh, sure, we move into houses and some of us get married and maybe we get a 401k plan or begin to say things like “back in my day…” but let me ask you all something. Is that really what it looks like to grow up? If growing up means a series of doing things that society has taught us to equate with adulthood, then there are a lot of adults roaming the streets out there. But maybe, just maybe, those things don’t make us grown up. Maybe you can be a 30-something year old ex-lawyer and be less grown-up than a 20-year old. And that’s the fundamental question of “Mixology Certification,” truly. It’s this question of coming to terms with your adulthood, with your actions, with the consequences of aforementioned actions, and also the realization that the things you don’t do in life often carry just as much weight as the ones you DO. I watched this episode with my best friend of ten years one night as we marathoned part of the season. After the tag ended, we sat there and I attempted to gauge her reaction. Slowly, she said: “That was really different than any of the episodes.” Hastily, she added: “It was really good, but you’d never know – just by watching that alone – that you were watching the same show.” And it’s true, quite honestly, that “Mixology Certification” is different in tone from other episodes. But it’s an episode that is so poignant, so heartfelt, and so very fundamental in order to understand the depth of these characters – that is, their identities outside of paintball or diorama-building or zombie Halloweens – that I will take a moment to give Andy Bobrow (@abobrow) a round of applause. So, as is customary for all of the blog-reviews, let's recap the plot for the episode, shall we? The study group is meeting in their usual room, all donning birthday hats and singing "... to you!" to Troy. (Since Troy is a Jehovah's Witness, they don't sing the entirety of the Happy Birthday song to him.) Everyone celebrates the young man turning 20, but Britta notes that they need to cram as soon as the party is over because finals are rapidly approaching. Jeff agrees, citing that they've begun to use celebrations as an excuse not to study (very nice meta commentary). This is an episode that is seemingly devoted exclusively to Troy. And (as I have literally said numerous times at this point), the sheer brilliance of Community hinges on a few things, one of them being the fact that even though an episode appears to be centered on one character alone, it often reveals much more about other characters than anticipated. This is an episode that is just as devoted to Shirley and Annie as characters as it is Troy. Note that I said “devoted” and do not necessarily equate this with screentime. In an episode centered around the milestone of someone’s life (a 21st birthday, in Troy’s case), characters find themselves questioning the state of their own lives. Shirley, for instance, attempted to bury her past – to run away from it, ashamed that her perfect, upstanding image within the group would be tarnished. She, like Jeff, would go to great lengths to ensure that the group sees her in a particular light and in that light only. Annie – in contrast – spends the episode questioning not her past but her future. She is the one character that viewers have come to attribute with stability. She’s the dayplanner, after all – a woman who is always prepared, always on time, and always at her best. But what the viewers (and Annie herself) realize as the episode wears on is that being an adult doesn’t always mean knowing who you are and who you should be. In fact, being a “grown-up” is perhaps the scariest thing in the world. But I’ve digressed, so let’s talk about the opening a bit before we discuss Troy, Jeff, and Britta as characters. Annie reads some facts about the year Troy was born as he opens his presents, and the group quickly discovers that Troy wasn't born in 1990 like Annie -- he was actually born in 1989, making that birthday his 20th and not 21st (his mom may have lied to him growing up...). A party in the study room is unacceptable for a 21st birthday, so Jeff and Britta insist that they all go out and celebrate at a bar. Once the two finally agree on one, they begin to head out the door until Annie reminds them of a crucial fact -- she's 19 and can't get into a bar. Britta agrees to find the young woman a fake ID to get her in and the group heads off. Shirley offers to drive Pierce to the bar -- remember that the elderly man broke his legs so he's in a wheelchair -- but he adamantly refuses. So I won’t talk about him much later on in the episode (until near the end), but Pierce’s character had the chance to display his own insecurities throughout “Mixology Certification.” Pierce prides himself on being independent. When he first introduces himself to Jeff in the pilot, he attaches his title (of Hawthorne Wipes) in the introduction as well. Why? Because it’s how he defines himself. And really, Jeff defines himself as a lawyer and Annie defines herself as a straight A student, etc. So when Pierce breaks his legs, he has to rely on others for help. It’s not that he’s lost his other title, mind you, but almost that he has acquired a new title that he isn’t fond of. Pierce cannot accept help – he and Jeff are very prideful – and would rather fail miserably at something on his own than accept the hands of someone else and be successful. Interesting, no? The men and women split up, and Annie spends the entire ride to the bar fretting over her fake ID. Britta insists that no one will know or care. One of the things that I love most about Annie Edison is that she is a lot like me. One of the things I hate most about Annie Edison is that she is a lot like me. So this episode is like holding up a mirror, examining my reflection, and recognizing the flaws in my own character. Again – Annie is always expected to be driven (it’s the one thing, Abed says in “Remedial Chaos Theory,” that will always be true). But what happens when your biggest asset becomes the thing you doubt most about yourself? While Annie is worried about her fake ID, the men are riding in Jeff's car. En route to the bar, he asks Jeff questions about what he needs to know about life post-21 years of age. And even at The Ballroom, Jeff and Britta (arguably those with the most life experience to give to Troy) instruct the younger man on what to do and what not to do. Troy has always seemed to – at this point in the season, at least – look up to Jeff as a leader. But something subtle changes, and it can arguably be attributed to this episode. There’s a point where TROY becomes the one with more knowledge and experience than Jeff and Britta. This episode is an integral one for Troy as a character, because – as Harmon said above – Troy is such a sincere, genuine, unpolluted person in every way. He’s fun and goofy, but he genuinely cares. And I believe I mentioned this in my review of “The First Chang Dynasty,” but Troy will sacrifice everything for the sake of a promise. In this episode, he’ll sacrifice his birthday for the sake of making sure the people around him – the people he arguably loves most in the world – are “fixed.” And I think that when Troy and Jeff clash as leaders in “For a Few More,” it’s not a revelation that appears out of nowhere – it begins, quite subtly, here in this episode when Jeff acknowledges that Troy is a man and allows him to drive the Lexus home. And it’s interesting because Jeff seemingly begins to think of Troy as an “equal” of sorts within this episode. But there’s a part of him (a VERY large part, arguably) that believes he is the leader of the study group and will always be their leader. And, because of this, Jeff doesn’t truly see Troy as an equal at the beginning of the episode (also, he doesn’t let Troy drive his car, so that speaks more volumes about his trust than anything). He’s still trying to be that leader, that instructor and guide for Troy when – in actuality – TROY is the one who teaches Jeff. The group arrives at the bar, Annie getting in without being carded (while Britta has her ID thoroughly searched over), and the bouncer recognizes Shirley and welcomes her back. As it turns out, Shirley used to frequent that particular bar and doesn't want her study group to know that tidbit of information, so she spends the remainder of the night hiding photographic evidence around the bar of her past. The group settles into a booth, where Annie -- when ordering a drink -- continues to adopt her fake ID patron's persona. Abed leaves the booth to go play a video game while Shirley and Annie decide to explore the bar. Troy continues to ask Jeff and Britta for advice, wondering what sort of drink he should order at midnight for his first legal drink. Troy is the type of person who values the opinions of others so much that he’s willing to (nearly) forgo ordering a drink he wants at midnight because he believes Jeff and Britta are more knowledgeable than he is. By the end of the episode, he realizes that this is not the case at all – that Jeff and Britta really AREN’T as mature as they insist they are to the rest of the world. Perhaps parts of Jeff and Britta realize this too (we’ll cover that later on). And Annie, on the other hand, realizes that she may be TOO mature. There’s a part of her that – until previously – the audience didn’t realize existed: a part that questions the very nature of who she is as a person. While Troy is trying to discover ways to grow up, Annie is trying everything to prevent herself from doing so to the point that she dons a fake identity for the night because it’s better than being who she really is. Abed is another interesting character to study throughout the episode. If we’re focusing on themes of identity and adulthood throughout the episode, then his short storyline is a prime example of the question of identity. I spent the vast majority of “Virtual Systems Analysis” discussing the importance of Abed’s insecurities and compulsions. “Mixology Certification” demonstrated the film student’s need for other people. Just like every other member of the study group, Abed needs to feel included, wanted, and – most importantly – understood. The study group “gets” him, and he longs to feel that way with others, which is why Abed spends the entirety of his arc in the episode talking to a complete stranger about a television show (who is hitting on him). He latches onto that person because, perhaps, he believes they will understand him. Abed knows that he is being hit on but is so desperate for someone to sit and listen to him speak that he dismisses the stranger's advances. I had to contemplate yesterday the reason that Jeff/Annie and Troy/Britta are drawn to one another and I think I may have come up with an acceptable answer. The reason that these pairings seem drawn to one another is because they provide the perfect balance. What I mean by that is that Jeff and Annie, as a pairing, balance each other out emotionally while Troy and Britta do similarly for each other. Placing two naïve people together in a relationship won’t do much to benefit the relationship overall – sure, the couple can learn together, but they’re likely to fall and stumble often because of their naiveté. Placing two “experienced” people together is harmful as well – Jeff and Britta were both jaded by the world and their bitterness and cynicism affected one another (it’s why they bickered so often, especially in this episode). But when Jeff and Annie interact, or when Troy and Britta do, there is a balance present – those who are naïve learn from new experiences, and those who are jaded learn to soften and open themselves up to the freshness of the world they once new. Troy and Annie are individuals who see the world in a way that Jeff and Britta only used to be able to. The beauty of the Jeff/Annie and Troy/Britta dynamics are that, when placed together with someone who is a seeming “opposite,” Jeff and Britta have the ability to reconnect with a world they thought was lost. Shirley continues to skirt around the bar, snatching up photographic evidence of her "bad" years. Unfortunately for her, Troy, Britta, and Jeff discover a framed photograph in the bathroom of the mother and begin to poke fun of her for it. Shirley is distraught -- she had some bad years and does not want to proudly display those to her friends, the people who are supposed to protect her and not make fun of her. Troy insists that they're all on her side and that seeing those photos of her makes them like her more because it indicates that she isn't perfect. That's not, however, what Shirley wants to hear. When Shirley leaves, upset, Troy is the only person who shows remorse. And perhaps it is because he wasn’t drunk like Jeff or Britta, but I choose to believe it’s because he (like he said earlier) doesn’t want anyone to be sad around him. He genuinely cares about people, and he would much rather spend the night comforting someone who needed it than laughing at their expense. That, more than anything, marks a true grown-up. Outside of the bar, Pierce has been attempting to maneuver his way through the door for (what we assume is) hours, and when he finally manages to position the wheelchair the correct way, the battery dies. This leaves him dejected, but also right in the way of Shirley, who is attempting to exit quickly. Endearingly, Pierce hits a point where he can literally not move in his wheelchair, so he asks Shirley for assistance. What I love is that even though Shirley had just faced embarrassment, she still helps the elderly man out. What’s even MORE endearing is that he says “pretty please” and then “thank you.” Clearly, Pierce hit the point of desperation. Back in the bar, Annie has hit a low point in the night -- in attempting to be Caroline Decker, she realizes that she doesn't quite know who she is or what she wants out of life anymore. She discusses her future career with the bartender and, after realizing how she has planned out the next fifteen years of her life, hits a point of despair and orders a screwdriver. Abed, who has been talking about Farscape the entire night (and ignoring Robert's advances) admits to his companion that he was aware he was being hit on -- he just really likes talking about television. Robert promptly throws a drink in Abed's face and leaves. Troy excitedly orders a drink at 11:59 (ending up choosing a Seven and Seven, in spite of Jeff and Britta's admonishing), and then looks around the bar at his dejected friends (and Jeff and Britta, who are apparently arguing in the corner about "The Hurt Locker" becoming a stage play), before walking all of his friends out of the bar and to Jeff's Lexus. Jeff, for all his faults, realizes what he put Troy through at the end of the episode when he says: “Troy, I think I owe you a birthday.” The young man insists that it's okay, seeing as he is driving Jeff's Lexus (which is something he's always wanted to do). When the group passes a street, Britta points out the bar located on it -- The Red Door -- and insists that is the bar the group should have gone to. Jeff notices the bar too and notes that it is a bar called L Street. The two, still drunk, laugh about the fact that L Street and The Red Door are actually the same bar. Annie notes that Troy can drop her off first, and Jeff and Britta note that the young woman lives in a bad neighborhood. Troy walks Annie to her door and the two have a scene that is probably one of my favorites in the history of the show between any characters. It’s funny because most viewers tend to forget that Troy and Annie have known each other the longest (technically I guess Shirley and Jeff unknowingly had, but whatever), but didn’t actually KNOW one another until community college. And what’s intriguing is that Annie doesn’t know who she is – she is struggling to find some sense of purpose or some justification that she’s doing the right things in life – and typically we assume that Troy doesn’t know much about Annie. But then, he sweetly describes EXACTLY who she is to her. He’s grown to care about her and learn the little quirks that make her Annie Edison. And sometimes people need to be reminded of who they are in order to become that person. Troy needed to be reminded that he’s not a dumb jock – that he’s a wonderful friend – before he could ACT that way, if that makes sense. Annie hugs Troy appreciatively and notes that everyone will probably be embarrassed on Monday morning. Troy disagrees -- no one did anything that bad, right? Meanwhile, Jeff and Britta are making out in the back of his car (with Abed sitting right beside the blonde). They break apart though and question what they're doing, agreeing that it's bad. The interesting thing to note about Jeff/Britta is that, before “Paradigms of the Human Memory” where they officially ended their relationship, this is the only canon moment where they both admit that they shouldn’t be hooking up. And what’s intriguing about that is that the only time they can think clearly enough to recognize their mistake is when they are both drunk. Troy returns to the vehicle, where Abed informs him of what Jeff and Britta had just been doing. Instead of blowing up at the pair, he calmly informs Abed that no one likes a tattletale. Jeff and Britta, seemingly having sobered significantly due to their actions, smile sadly at the young man. It's a moment that isn't entirely significant in the grand scheme of the series -- but the next moment, Britta wishes Troy a happy birthday and Jeff insists: "You're a man, now." And I think that this is the moment that Troy stops becoming the guy that viewers see as a lovable goofball and instead evolves into that lovable goofball who fixes, helps, and betters his friends. 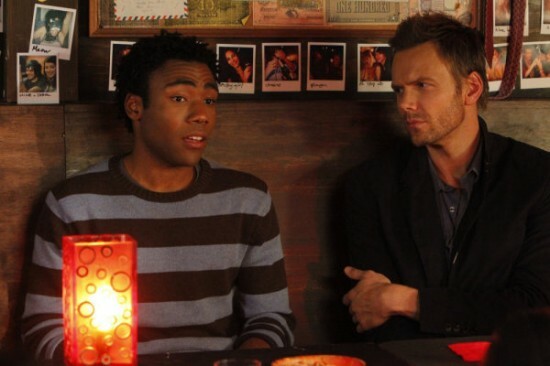 - “Hello during a random dessert, the month and day of which correspond numerically with your expulsion from a uterus.” From that moment on out, every Community fan – instead of wishing “Happy birthday” – said “Happy expulsion!” to their fellow fans. True story. Well, for most of us, anyway. - “Pierce, what is this? What are you doing? Explain yourself.” One of my favorite deliveries of a line by Joel. - I love that Annie loves Mark Ruffalo. This is far and away my favorite episode. I think its the most revealing of the individual characters because of how each scene was written. Also, taking them out of the familiar element (the school) seemed to amplify their faults/insecurities/etc. Its not exactly the funniest. It's somewhat sad throughout. But in the end, it became very positive and heartfelt because of the realization that Troy attained, and the small realizations each character experienced(except maybe Abed). I've already told you how much you win with this. Ahhh...the joys of GChat. What sticks out to me in this episode is how Donald doesn't get nearly enough credit for how layered his performance is. He is so so so good.